Take a look at any mainstream yoga rag, and you might think “yoga” means skinny white ladies lounging around in stretchy pants, talking about probiotics. But yoga is so much more. Yoga’s smart. Yoga’s radical. Yoga’s counter-cultural. The modern yoga scene is at a tipping point. Commodification and “Instagramification” have transformed this profound meditative practice into a trendy, upper-middle-class fitness craze. It’s time for populist, philosophy-loving yogis to reclaim yoga from its widespread assimilation as a sanitized, fashion-driven workout. Believe it or not, the philosophical tradition’s got much wisdom to offer regarding the messy, sweaty, sacred/profane reality of being alive. 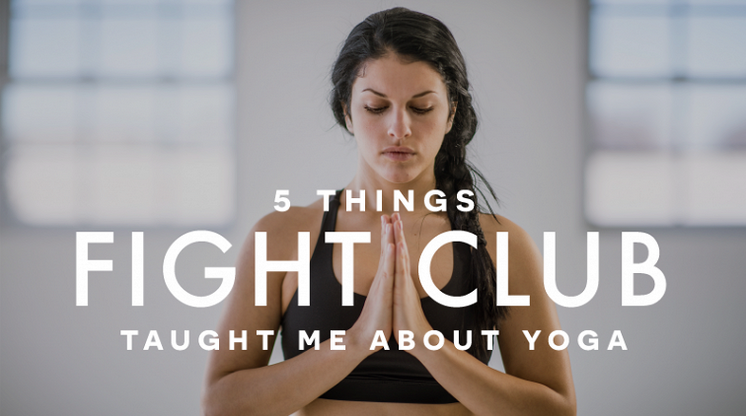 Which brings us to…Fight Club. Yep, you heard me right.